The audio device is plugged in correctly. Make sure that you computer’s device drivers are up-to-date. If there is physical damage to the device or if the problem persists after rebooting your computer try using a different device. Make sure the device you are using is optimized for Lync 2010. For a list of optimized devices, see Phones and Devices for Microsoft Lync 2010. 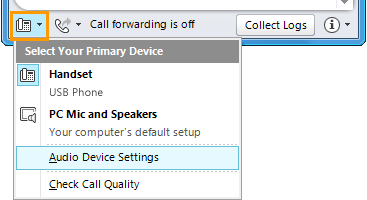 Make sure the device you’re using is selected in the Audio Device Settings in Lync. Open Lync, and, in the lower-left corner of the Lync main window, click the audio device menu, and then select the audio device you would like to use for your Lync calls.